I've had these for a week or so, just haven't updated the blog! 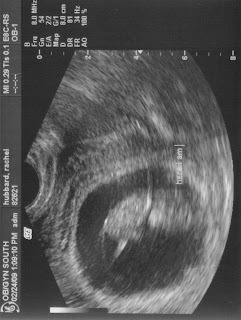 These are ultrasound pictures of Baby Hubbard #2! This is at about 11 weeks. You can see the outline of it's leg and body better in these. 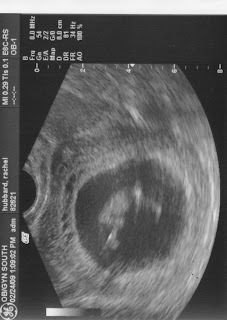 The pictures are sideways though, I can't seem to rotate pics when I scan them, so Baby is curled up and is facing downwards.It was so neat to see it in real time swimming around in there! I probably won't have any more pictures until about 19-20 weeks.